After reading some good reviews about this place, I wanted to give it a try myself. So I found myself in Jaya One (Coffee Ritual, Nagomi, Kissaten, Heng Kee and D'italiane) once again. Since my colleagues felt a Japanese meal at the end of the month is taxing to their pocket I ventured out alone. The place was rather empty during lunch hour and the décor is similar to what other Japanese restaurants. They even play similar songs. Oh well, I was there for the food. I scrutinised the menu closely and the range is what you can expect from a mid-range restaurant like this. However I was surprised that it doesn't serve any dessert at all. There was no drinks menu either. Strange but true. The quick way to judge a restaurant is to order sashimi. 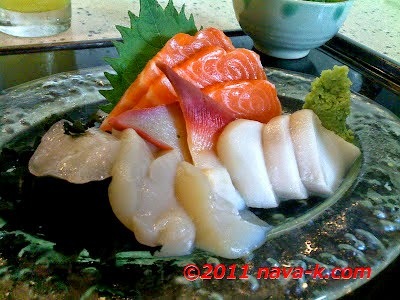 I went for the Sashimi Zen set lunch which consisted of four types of raw items served with rice, soup, fruits and salad. I was rather impressed of the cuts of the fish. They were of substantial thickness served on a bed of shredded lettuce and wasabi. I had salmon, white tuna, scallop and something I couldn't identify. The fish didn't feel cold so I wondered if it was left sitting out for some time. I was happy with the salmon which had streaks of fat and a bit of sinew in it. As for the white tuna, it was buttery but not as firm as I would like it to be. The biggest disappointment was the scallops. It was not fresh at all and carried a certain smell on them. Even hours after consuming the scallop I had a nasty after taste. Definitely, not worth its RM33 asking price. If it wasn't fresh, why serve it? Just compensate with something else. As mentioned earlier, it came with rice, some fruits and chawan mushi. 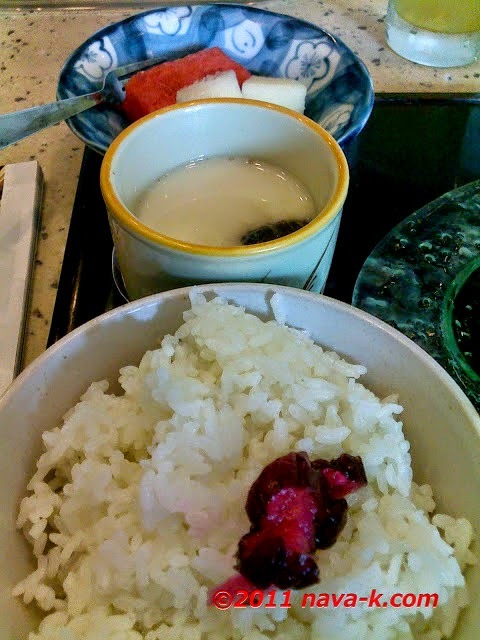 The rice and fruits were regular stuff. The chawan mushi was small but had the traditional ingredients inside such as ginkgo seed, bits of chicken, slice of mushroom and so on. 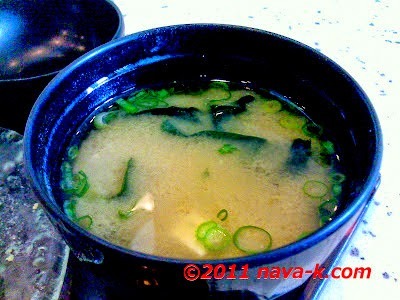 Since the scallop was nasty, I had to down the miso soup generously. It had some mushrooms, seaweed and tofu in it. Nothing noteworthy either. Perhaps I picked the wrong item off the menu. Next time I might just give it a second chance and try some yakitori or teppanyaki items. It's always sad when a meal out is disappointing. And I completely agree with you - if it's not fresh, why serve it? I think sometimes we have to try and then know for ourselves on the quality of work. No drinks on the menu? not even green tea or sake. I love Japanese specially fresh sushi. Yum!